Martha Stewart Has My Number! Guess Who Won the EasyBloom Plant Sensor? They say that time flies when you're having fun and we must have had a ball in 2009, because here we are, paying our last respects to it before moving on to new adventures in 2010. It's always fun for me to look back on the current year to see where we've been, which many times explains just where we're going. 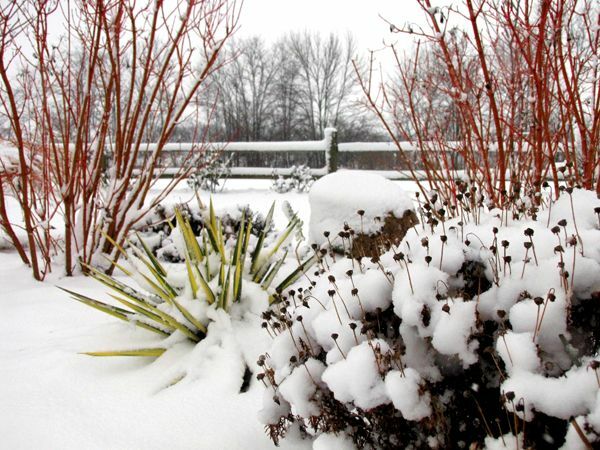 January was just one month in The Winter That Would Not End, but we had our Amaryllises to keep our green thumbs warm. We also reflected on why we garden and what our garden and home means to us. I think that post may be the best one I wrote this year. It certainly was one of the most personal. February brought respite from the cold in the form of a trip to Florida, where Jenna and I visited my aunt and uncle and reveled in the warmth of the sun and the loveliness of tropical blooms. 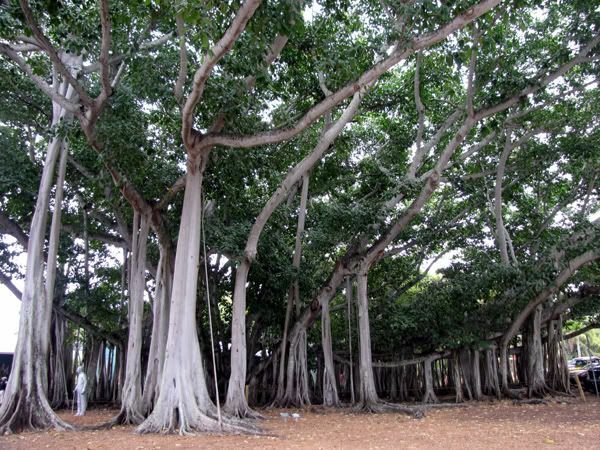 We all went to Fort Myers, where we toured the Thomas Edison and Henry Ford Estates and Gardens, home of the world's largest Banyan tree. I got to meet Meems of Hoe and Shovel, who lives near Tampa - definitely a highlight of the trip. February is also the beginning of the garden show season, and Mom and I attended the Ft. Wayne Home & Garden Show at the end of the month. March was fairly uneventful, other than acquiring a beautiful blooming Clivia miniata. I'm happy to report that it's thriving and has even sprouted a baby at its base. April is one of my favorite months because spring bulbs erupt and let us know that there is another glorious season of flowery goodness beginning. It's also the month where we begin to visit garden centers and decide which new plants will join our gardens. 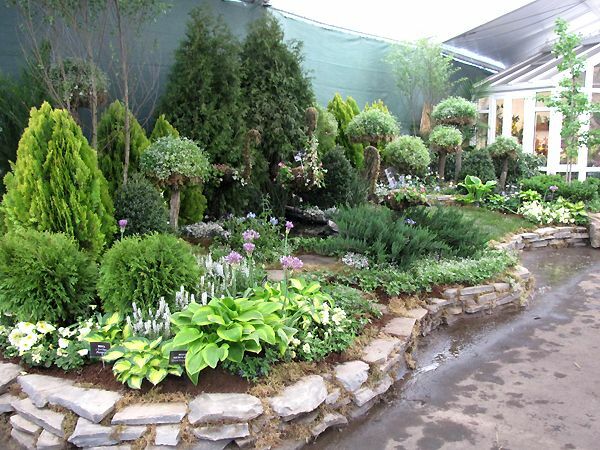 The end of the month brings the annual Cincinnati Flower Show. I got to meet yet another garden blogger - Lisa of Greenbow - when she and her husband stopped for a visit on their way home from Michigan. May consisted of unseasonably warm weather and became one of the busiest months of our gardening season. Besides all the spring work that is usual for May, Mom and I did some garden-related traveling, first to Cleveland, where we visited the Cleveland Botanical Gardens, as well as Schedel Arboretum and Gardens near Elmore, on the way home. A week later, we spent three days in Chicago at Spring Fling Chicago 2009, which was a wonderful gathering of garden bloggers from all over the country. 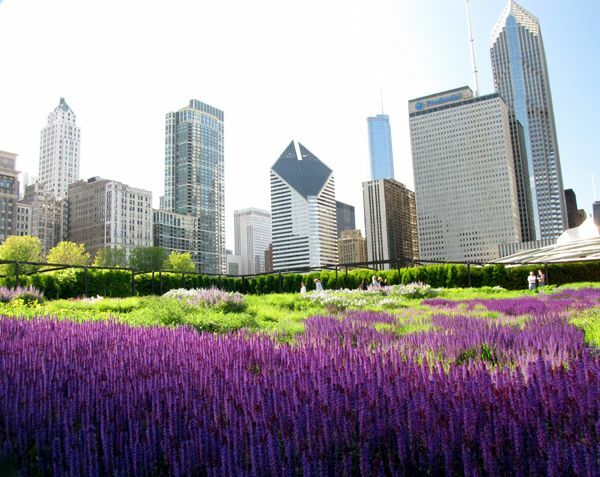 Our hosts did a marvelous job of planning visits to the best gardening sites Chicago has to offer, but it was even more fun meeting and getting to know fellow bloggers whose voices we'd only previously heard online through their writings and photography. I did a series of several blog posts about it all. In June, I got together with another garden blogger that lived not all that far away from me, but we'd never met. Bren of BG_Garden and I spent a fun day in her gardens and emptying our purses at a local greenhouse. At the end of the month, Mom, Sue and I took a couple of days to travel north to Michigan, where we visited Hidden Lake Gardens, Michigan State University Gardens, and Frederik Meijer Gardens and Sculpture Park. The latter just blew me away with the size and beauty of it all and I'm sure I'll make a return visit or two. July took a cool turn and we all wondered where summer went. It was the coldest July on record for our area. That took its toll on most of the annuals and a few vegetables that needed both heat and rain to grow, and we had neither. 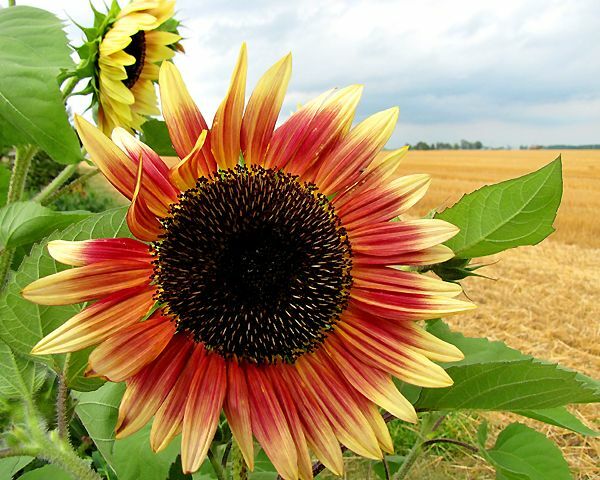 The sunflowers didn't seem to mind, however. 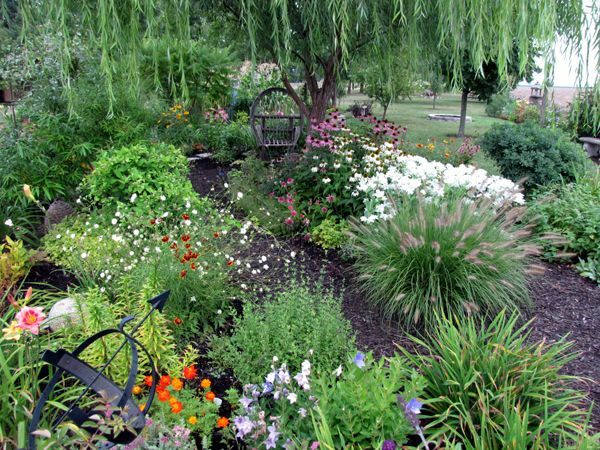 In August , our gardens were part of the Van Wert County Master Gardeners Garden Walk. Over 100 visitors drove out to look at our flowers on the hottest day of the year. (Yeah, I know...crazy weather couldn't make up its mind!) One visitor drove 4½ hours (one way!) to see our gardens. Wow! Also in August, we celebrated our 34th wedding anniversary in Chicago, where we'd gone to cheer daughter Kara on as she ran the Rock 'n' Roll Half Marathon. (Go, Kara!) While there we visited friends and Cantigny Gardens. No, I haven't blogged about those gardens yet, but will do so in the next month. September provided a bit of a breather in the garden and by the end of the month, we were flirting with frost. The annual Blotanical Awards were presented and Our Little Acre was honored to have been voted "Best Ohio Blog." Thank you to faithful readers and those that gave us their vote! Two new kittens found their way to our place, bringing the kitty population to 11. 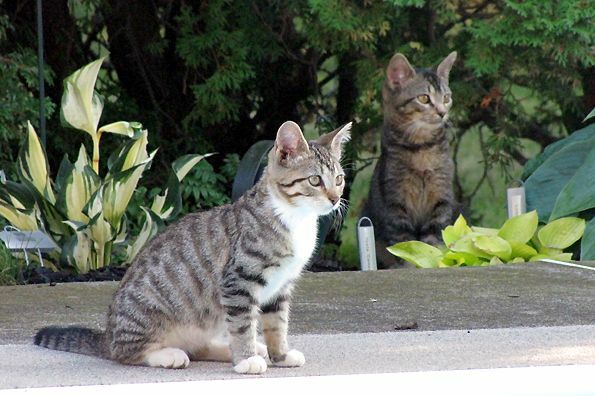 By the next month, however, two of our crew had been adopted out, so we're now at seven outside cats and two inside. 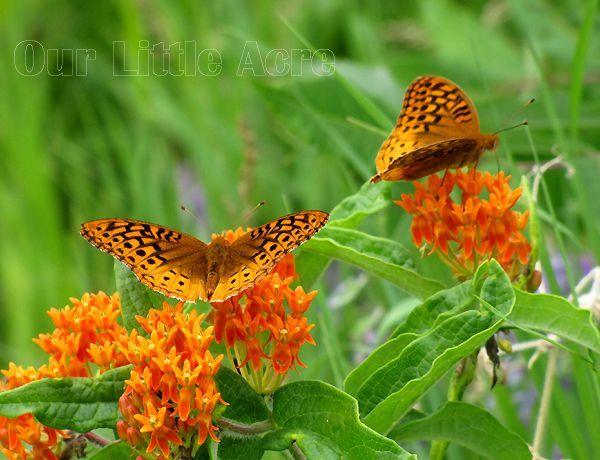 In October, Our Little Acre got its own Facebook fan page, so if you're a Facebook user, I'd love it if you'd click on over and become a fan! November proved to be exciting for two reasons. First, Mom and I were asked to do a short video about the Smiley Park Children's Garden for Shirley Bovshow's Garden World Report. Shirley is great to work with and we had fun doing it. You can view the video here. Our segment is towards the end of the 15-minute video. Then I decided to launch another website, Gardening by the Book, which is a site devoted to reviews of gardening books. This site also has its own Facebook fan page. (Yeah, becoming a fan of this one would make me smile, too. *wink*) As you can guess, the two blogs keep me quite busy, in addition to working my usual job in dental research! December had a warm start and I got the last of the bulbs planted. Then winter decided to show up and we got snow in time for a white Christmas. Christmas brought a new orchid table, made with love by my dad, which made me very happy and the orchids are pretty darned pleased about it, too. Now they're getting the light and humidity they need. As you can see, it's been a good and busy year. 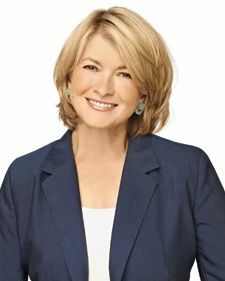 2010 will start off with a bang, too, because Mom and I leave in two weeks for New York City, where we'll be attending The Martha Stewart Show for a special audience event on blogging. It will be the first time in NYC for each of us and we're looking forward to making great memories together in The Big Apple. Stay tuned for that! I want to thank the readers of this blog for doing so and for the lovely comments some of you leave. I've not always been the best at answering comments, but I read each and every one and appreciate that you've taken the time to leave them. As I start my fourth year (!!!!) of writing this blog, I still love doing it and I'm glad to have met so many great people as a result of it. I wish you all only the best for 2010! Our Christmas days were filled with good times spent with family and friends and I hope yours were the same. Our family excels at giving gifts that have a special meaning and those that take a great deal of time and thought regarding the recipient, and this year was no different. I received several things that reflect my love of gardening. 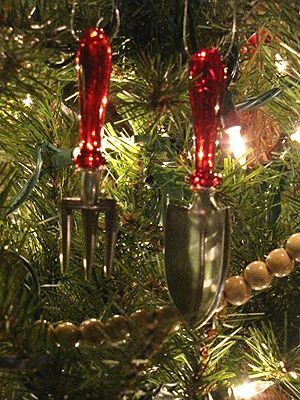 Kara gave me a set of ornaments that only a gardener could love. And I do! She also gave me a book I've been wanting for a long time and can't wait to read. 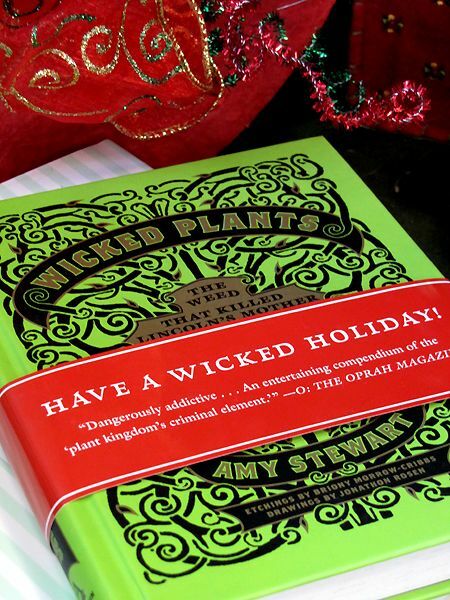 While I love the ornaments and the book, one very special person gave a very special gift to me. My dad, as many of you already know, possesses killer woodcrafting skills. He has made a bedroom suite for both Romie and me, as well as for Jenna and her husband Joe. Our home contains numerous pieces created by him and they will be his legacy - those, and the love he put into them as he made them. 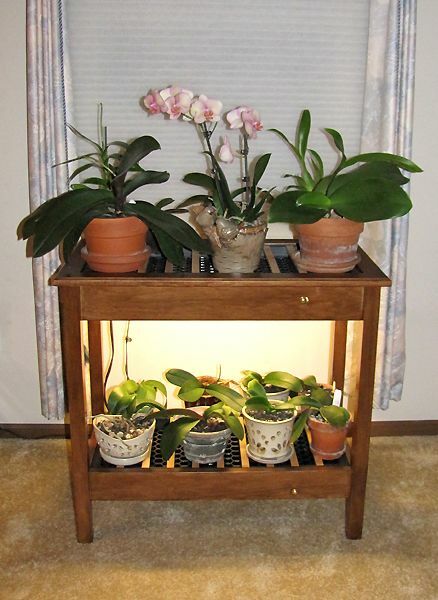 My new orchid table resides in the living room, where the orchids are now kept happy and healthy with a gro-light and humidity trays. "Thanks, Dad," seems like such a trivial way to express my gratitude. I hope you know how very much I love you and the orchid table, and all the other wonderful things you've made for us throughout the years. I'm a very blessed little girl. Oh, and the rest of you should know he also made an orchid table for both Kara and Jenna. They're very lucky little girls, too. When I was younger - much younger - my love of receiving mail went off on a tangent and I enjoyed collecting postcards. I've got many old ones in that collection, some of them being charming and ornate. 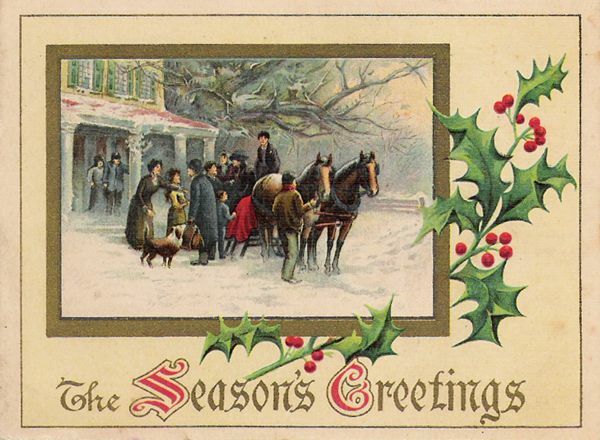 I scanned one of the holiday cards to share with you today. As Christians, we celebrate the birth of Jesus. To our Jewish friends, we wish you a Happy Hanukkah. To those of you who celebrate this season in other ways, we wish you happy days and all good things for the future. 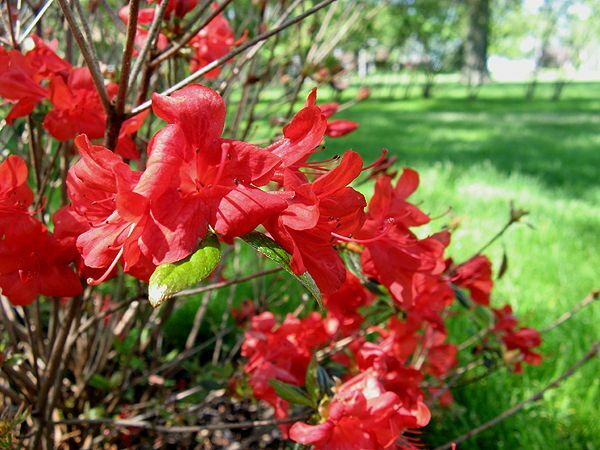 Azaleas are somewhat of an iffy sort here in Zone 5b, meaning they are supposed to survive our cold winters and bloom beautifully in the spring, but sometimes they do neither. 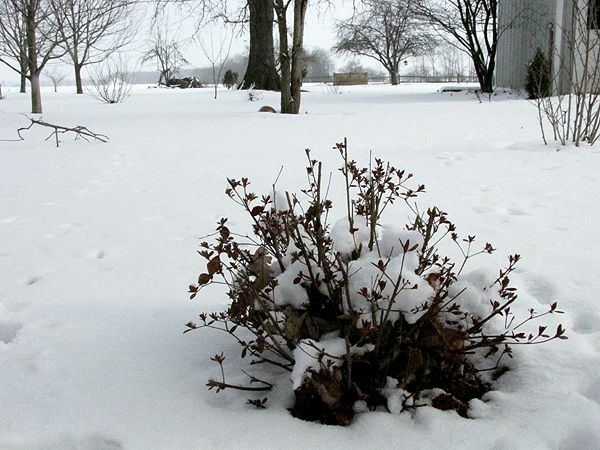 I've lost a couple of them to the cold and while the lone shrub we have now has made it through a couple of tough winters, it didn't bloom much this past spring. Knowing it is a marginal shrub for me, I've always mulched well, but there are other outside forces that conspire to bring it down from its potential glory. 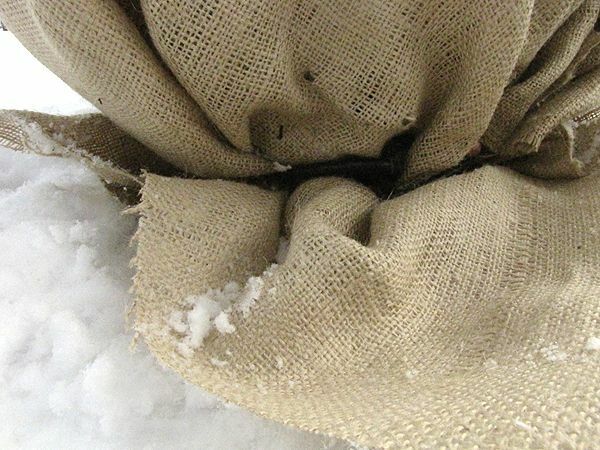 Freezing and thawing, drying cold winds, and scalding winter sun can do a number on trees and shrubs, so a little extra protection may be needed. 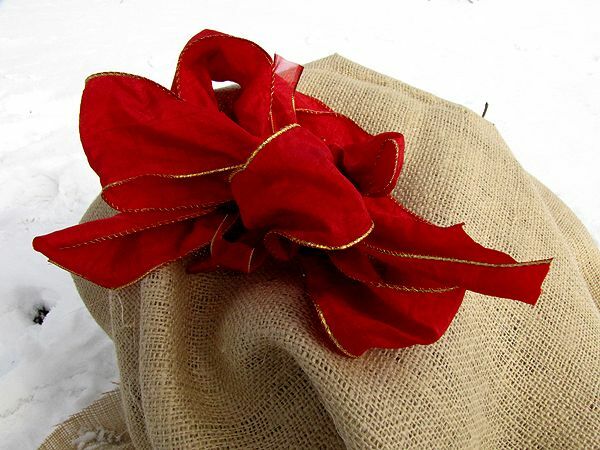 This year, I decided to wrap the azalea in burlap. Our local Walmart had plenty of it in their fabric department for $2.49 a yard, so I bought 1½ yards, which was plenty to lay over the shrub and wrap it loosely. 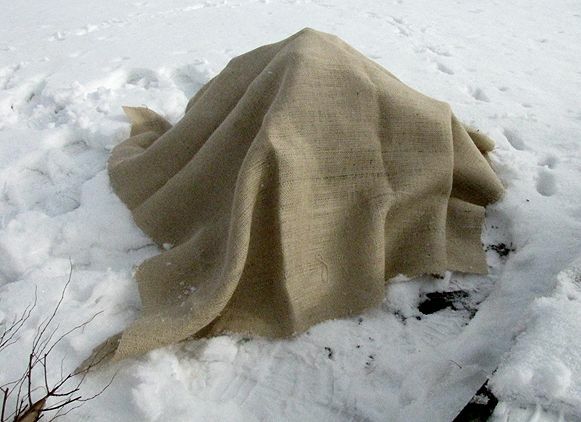 I secured the burlap at the bottom with a hooked bungee cord, so the winds wouldn't blow it away. Other ways of keeping it in place are with ground staples or stakes. We awoke to a winter wonderland this morning! 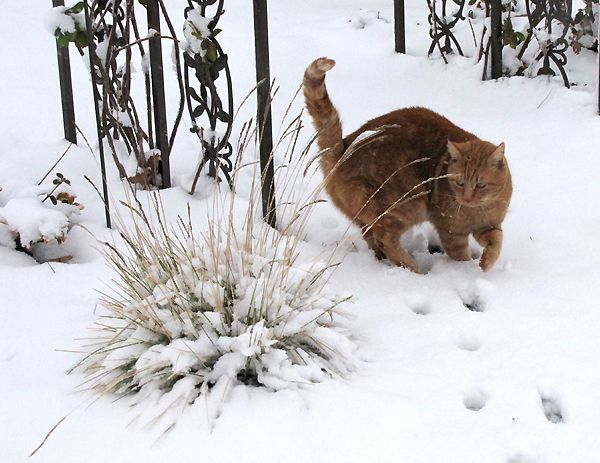 Later today, we'll be celebrating a family Christmas and the snow is perfect for putting us in the holiday mood. It's a busy day, but I took a few minutes to go walkabout and capture a few images of the snowy beauty. 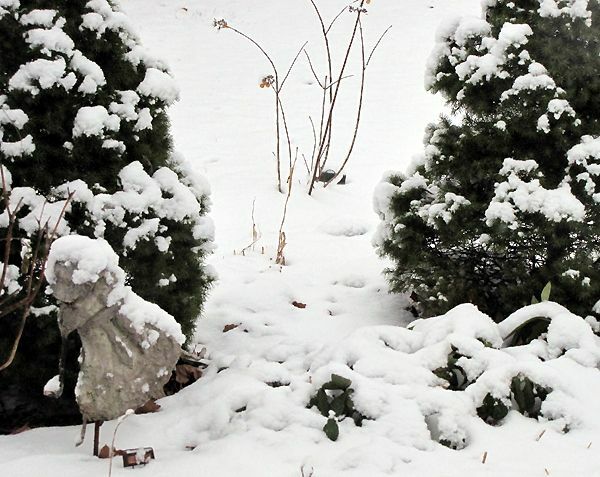 Garden girl dances in the garden by the snow-covered Hellebores and the Dwarf Alberta Spruces (Picea glauca). 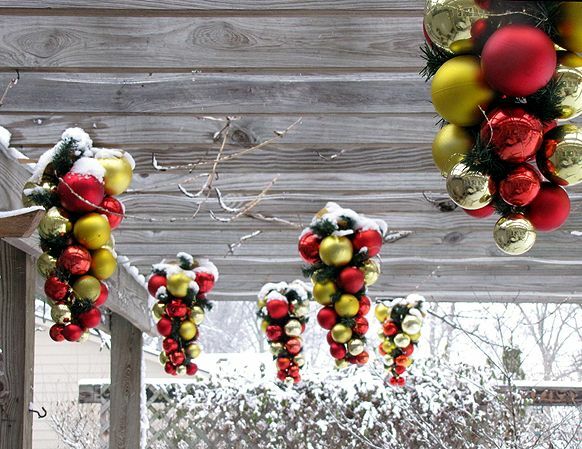 The Christmas ball clusters that hang from the pergola never look so pretty as when they're laden with snow. Max keeps watch over "his" garden. The Autumn Moor Grass (Sesleria autumnalis) is a four-season ornamental that's one of my favorites. Strangely, it's one of the few grasses that the cats don't munch. The annual Marguerite Daisies (Argyranthemum frutescens 'Madeira Cherry Red') collect puffballs of snow, making them attractive, even in death. The Red Twig Dogwood (Cornus sericea 'Cardinal') has put on its red coat, while Yucca filamentosa 'Color Guard' glows. Four days ago, I was hanging out in Twitter, when someone tweeted that The Martha Stewart Show was "calling all bloggers" to apply for tickets to attend the taping of a special show she was doing in January on blogging. Having never been to New York City and being a blogger, I gave some brief thought to this and filled out the form for tickets. No date was given for the show; it was only stated that it would be in January. It was required that you give an explanation as to what your blogging passion was, in as much detail as possible. Only two tickets would be given for this show, instead of the usual four-ticket limit and you had to tell who was accompanying you to the show and why. Of course, my mom was the person I wanted to go with me. We've actually half-heartedly talked about going to New York someday, since neither of us had ever been there. Of all the people in the world, my mom is the one I most enjoy traveling with. She's always up for any adventure and we have such similar interests that it's like we're one person when it comes to making decisions about what to do and where to do it. OMG. How cool is that?? I called Mom immediately and after sharing the excitement of getting to visit The Martha Stewart Show, a little bit of reality set in. Living the entire width of Ohio and Pennsylvania away from New York City meant we'd have to fly there. ($) And then there's the matter of ground transportation. ($) And hotel accommodations. ($) I'm pretty good at creative financing, but I'm not sure this is doable. I've got until December 23rd to confirm our attendance, so between now and then, I've got to figure this out. I've just GOT to. How often does an opportunity such as this come along? Sure, I might be able to secure tickets to the taping of a show, but this one is special. All in attendance will be bloggers. Blogging. On the show. Just too much FUN! There are strict dress guidelines to be followed. Solid colors recommended and no black, gray, tan or any muted colors, T-shirts, prints, logos, hats, or sleeveless tops. We are to bring our laptop, iPhone or Blackberry and must let them know which of these we'll be bringing. We are to be prepared to be photographed and since Martha likes audience participation, there is the possibility that any of us could be chosen to be an active part of the show. There are questions to answer about our blogging that must accompany our confirmation. Whew. This is all somewhat overwhelming, because by next Wednesday, we need to figure out if we can make this happen on our end. It's not only a monetary issue, but I'm scheduled to work the day of the show and the day before. I've got great employers, but I work at a research facility and when a study is to be done and you have a specific role to play in that study, you have to be there. So...a lot has to happen between now and then for this to become a reality. I've always said that I never want to let an opportunity go by if I can help it at all. If it's meant to be, it will be. If it's not, well, it was nice to dream about how fun it would have been. UPDATE: Just one more hurdle to jump before this happens! I'll find out on Monday if the work situation will be resolved. If so, NYC here we come! 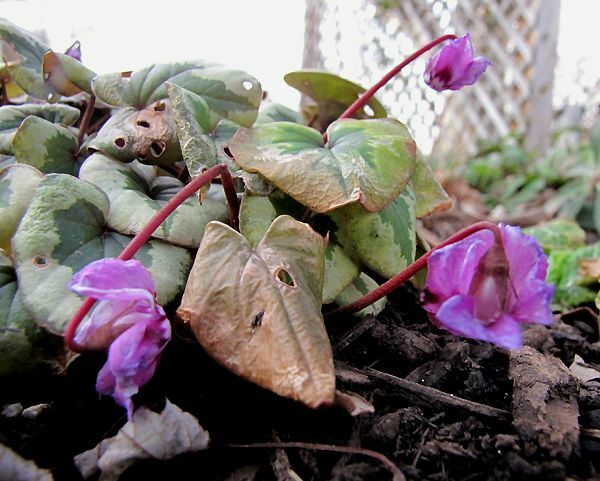 The Cyclamen coum may take the prize as the most persistent bloomer, but on second thought, maybe that's why it's called 'Something Magic.' Wonder what it will look like come January? 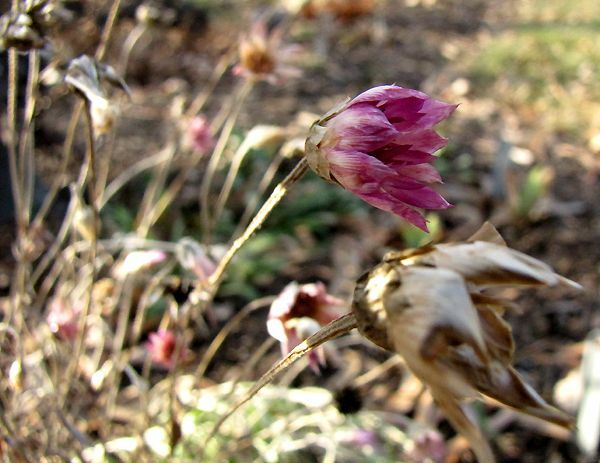 Out in Max's Garden, the annual Xeranthemum annuum is technically still in bloom, but in actuality is probably just frozen in time. Its more common name is Everlasting, though. 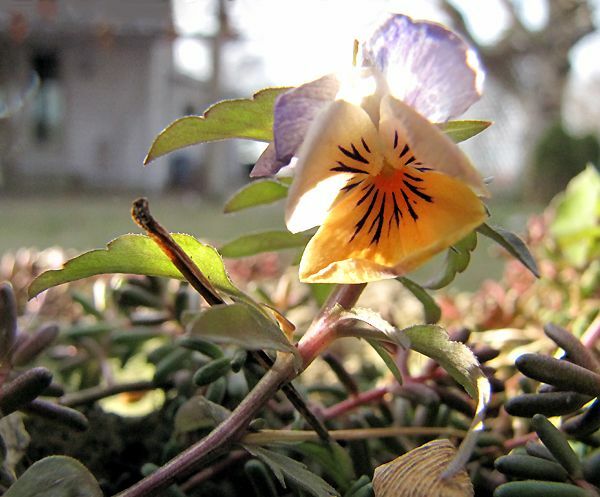 The one that made me smile however, was this lone Viola. It isn't even planted in the ground. For three years, it has resided in a hypertufa pot my mom made and for three years it has delighted us with its delicate blooms, even deep in December. 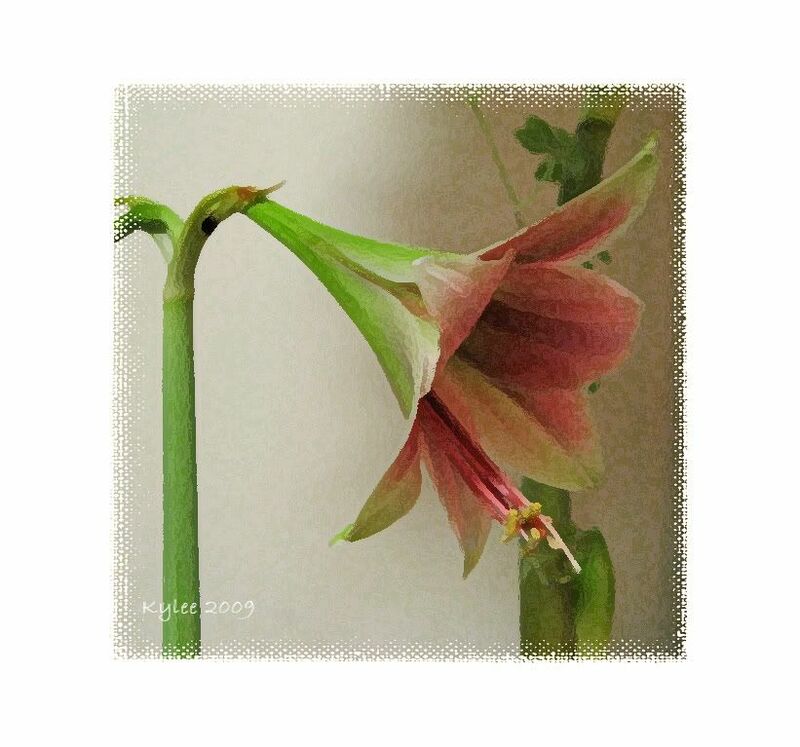 See what other gardeners have blooming now on May Dreams Gardens blog. Thanks to Carol for playing host! Someone is going to be very happy to learn that they have won the EasyBloom Plant Sensor! As of midnight last night, there were 24 comments left on the qualifying post, but one of those was by me, in response to other comments. 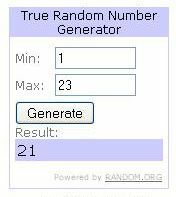 So when I used the Random.org random number generator, I threw my comment out and entered a range of 1-23 for it to choose a winner. Now what you need to do, Ms. Muum, is to e-mail me through my profile and give me your mailing address so I can send it to those fine folks over at PlantSense. They will then send you your prize! Congratulations to Muum, and thank you to all who entered the giveaway. A very special thank you goes to PlantSense for sponsoring the giveaway in the first place. Now we are truly in winter mode in our gardens, which to us northern gardeners means we look back fondly on summer and forward to spring. One thing I also like to do is remember the fabulous gardens I've been fortunate to visit during the past year. One of those is Frederik Meijer Gardens and Sculpture Park in Grand Rapids, Michigan. Frederik Meijer Gardens & Sculpture Park opened in April 1995 after 13 years of planning and fundraising by the West Michigan Horticultural Society. 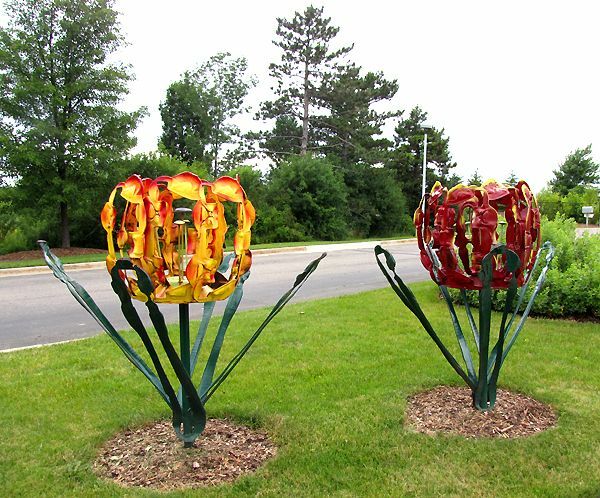 In 1990, Frederik and Lena Meijer were asked for their support, and they embraced the concept of a major cultural attraction centering around horticulture and sculpture. 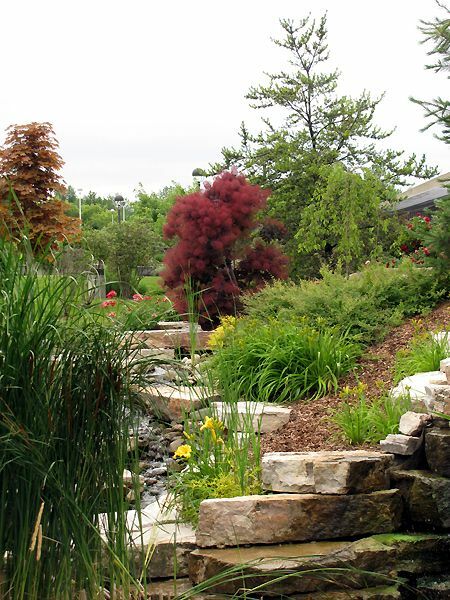 The original vision has turned into a top cultural destination within the Midwest region, known internationally for the quality of its art and gardens. I'm not sure I can adequately describe in words or pictures the scope and beauty of this place. As Michigan's second most-visited tourist attraction (Mackinac Island is the first), in May 2009 it was named on of the "Top 30 Must-See Museums" of the world. I had a very hard time choosing what to tell and what to show here in one blog post. That's why it has taken me so long to finally post this. For every photo you see here, there are five more on my hard drive. I just couldn't stop taking them. As Mom, Sue and I roamed around the 132 acres of beauty and inspiration, there was just one ooh and ahh moment after another. I could have spent all day and then some, exploring the gardens, conservatory, and sculpture park. It is recommended that you spend at least four hours to see everything and state on their website that it can take up to eight. For me, it could take eighteen. The welcome center itself is a work of art. Those are bronze insets in the floor. ...as well as gorgeous blues and greens. Wish I could remember what these fabulous lavender flowers are. As you enter the gardens from the welcome center, you are greeted by this beautiful water feature. There are many areas left to be decorated by nature. I saw my first Cedar Waxwing, up close and personal here! This smoke tree (Cotinus coggygria) caught the attention of everyone who passed by it. 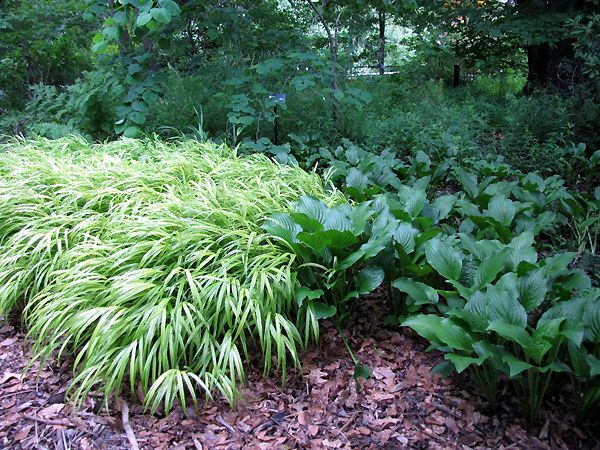 Why can't I grow my Hakone Grass (Hakonechloa macra) lush and full like this? Oh yeah...seven cats who think it's delicious. There is a 1930s style farmstead, with a home that is a three-quarter scale 1880s reproduction of Lena Meijer's childhood farm home. The garden grows many heirloom vegetables and flowers - open-pollinated for over 50 years. The barn is original (moved to this location) and over one hundred years old. 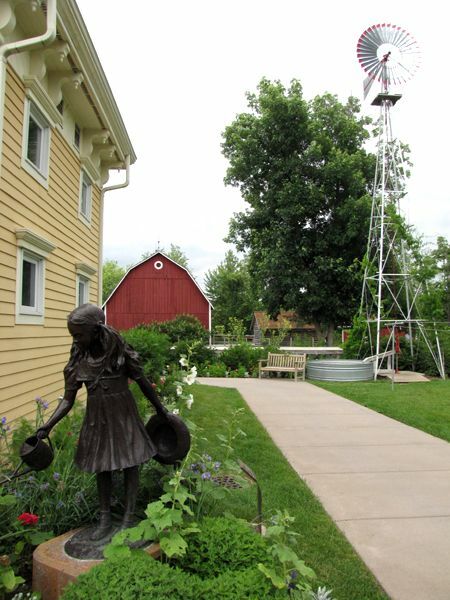 The windmill is the original from Lena Meijer's family farm. 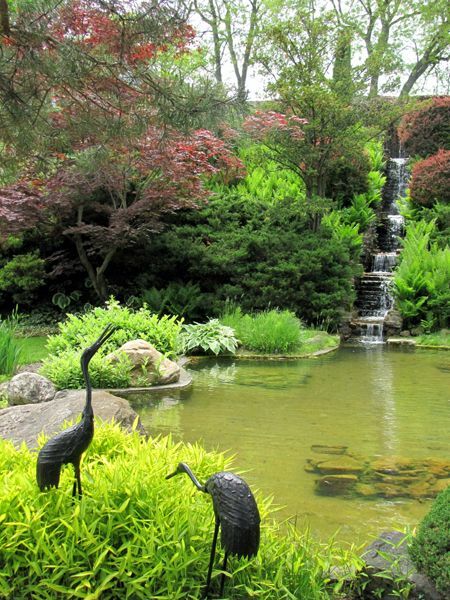 Frederick Meijer Gardens is home to the largest tropical conservatory in the state of Michigan. The Tropical Conservatory has colorful birds flying about. In March and April, they are home to the largest temporary tropical butterfly exhibit in the nation. This scarecrow was about a foot tall. These are the five great lakes and children can start a boat floating from Lake Superior and watch it make its way through all the lakes. Great use was made of Allium sphaerocephalon. Because of this, I added even more of these to our gardens this fall. 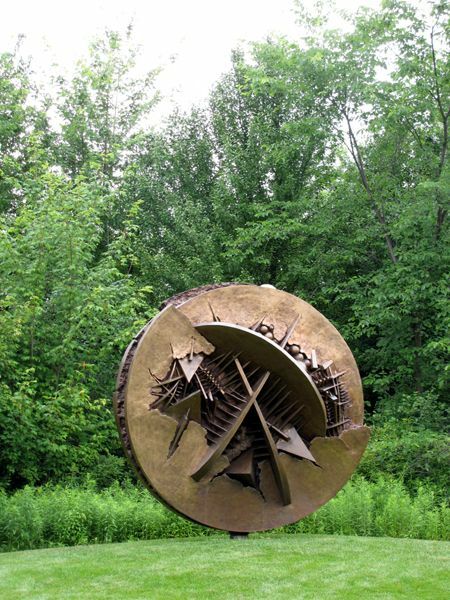 There are over 160 sculptures on the grounds of Frederik Meijer Gardens and Sculpture Park. I've identified those that I can. Other identifications are welcomed and will be added as received. 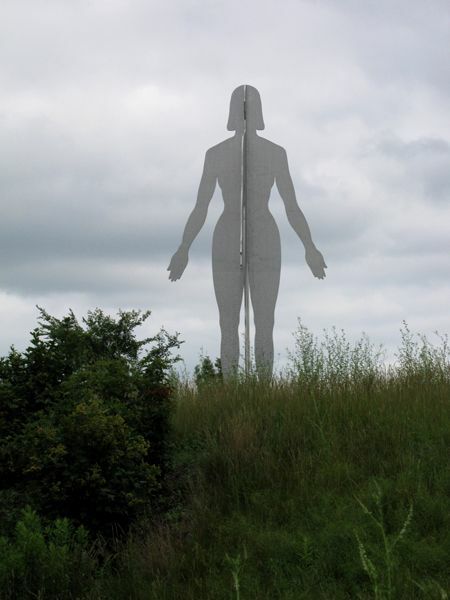 When viewed from a 90-degree angle in either direction, this sculpture appears to be a male. 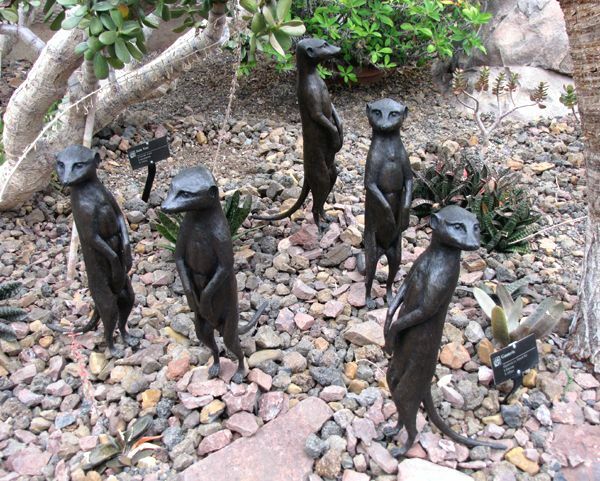 For the best description of what the gardens and sculpture park have to offer, I'll refer you to their website. 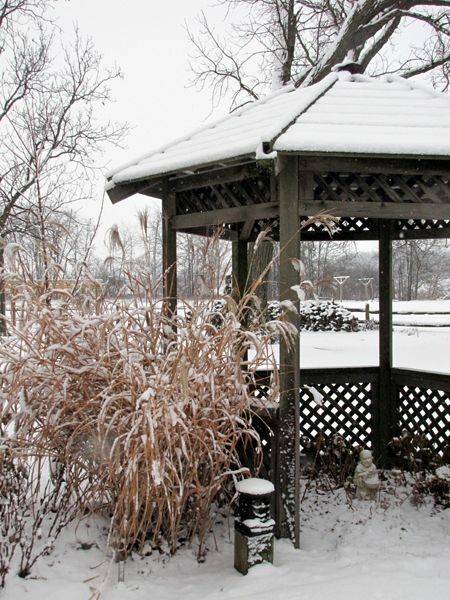 Fellow blogger, Monica (Garden Faerie), has also posted about her visit to the gardens during this holiday season. Be sure to have a look!